This is a tradition breakfast of sweet vermicelli served with egg found here in Arabian Gulf and a perfect comfort food for Sahoor, we have used orange and lime to give it citrus twist. Boil 100g of vermicelli in water till soft then remove. In a pan melt the butter then add the cooked vermicelli and 40g sugar, toast slightly. Add the orange juice, Knorr Lime Seasoning, rose water and saffron then cook till liquid is absorbed, add the spices and mix through. Blanch the remaining vermicelli 350g in warm water for a few seconds just to soften, remove and pat dry then shape into a nest. Brush the vermicelli nest with the ghee, toast in the oven at 160°C till golden and slightly crispy. Remove from oven and dust with remaining sugar. Melt the butter in a pan and fry the eggs on medium heat till cooked then season with Knorr Chicken Stock Powder. Add the saffron, orange juice, Knorr Lime Seasoning and sugar to a pot and simmer to make a syrup. 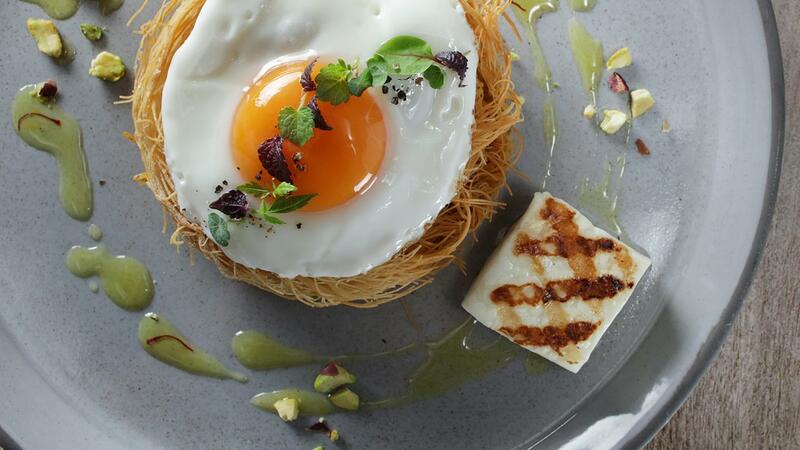 Plate the soft vermicelli in the nest shaped vermicelli top with eggs and grilled goat Cheese, finish with the saffron syrup and pistachios.